The Galapagos Islands are undeniably biodiverse with incredible wildlife that never fails to impress us. However, as much as we love the land animals habiting the islands, we can’t ignore the exuberant marine life in the surrounding oceans. While snorkelling, you can encounter amazing and unique sea animals that are more than impressive. Some of them being: the king angelfish, the razor surgeon fish, the extraordinary red-lipped Galapagos batfish, spotted eagle rays, green sea turtles, and many more. We are missing something… the sharks. As frightening as they may seem, the existing sharks on the Galapagos Islands are friendly, and it’s safe to snorkel around them. They are without doubt a spectacular sight, especially when you are so up-close and secure around them. 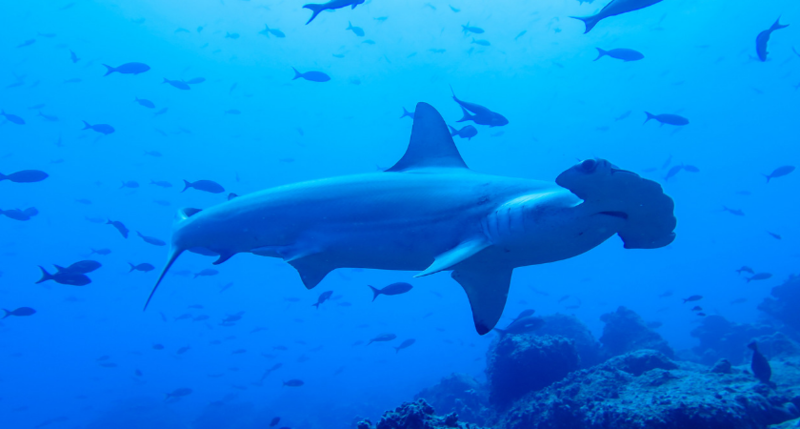 The main species you can encounter are: whale sharks, whitetip reef sharks, and of course, the scalloped hammerhead shark. Truely, the Galapagos Islands are a magical place!